You are here: Home / Weekly Columns / Opinion / 2018 iPad Show: There is Unfinished Business There. 2018 iPad Show: There is Unfinished Business There. 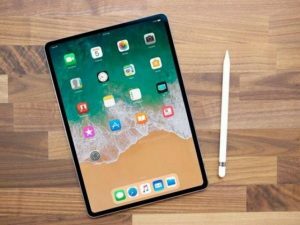 (ThyBlackMan.com) Though the 2018 iPad official announcement is still due, media sources suggest that the company has some interesting plans for its new iPad Pro tablets. Apple dominates the tablet market with its iPads, though the market is not as strong as it used to be five years ago. Other than the brand image, Apple’s iPad thrives on the overall ecosystem the company has developed. At the September event, Apple didn’t showcase 2018 iPad Pro and left everyone clueless about the future of the company’s most anticipated product. If reports are accurate, the new iPad may be the hottest iPad in a long time. Apple doesn’t put a crazy price tag on its iPad Pros, so it’s fair to assume that the company will most likely keep the price right. Here are the 2018 iPad highlights based on the latest reports and industry projections. The new iPads will be available in two screen size options – 11-inch and 12.9-inch. Apple is reportedly planning to bring two new iPad Pros and there will be a substantial revamp in the design. The 2018 iPad Pros are expected to sport slimmer bezels and Face ID. The home button will be gone and Apple will also remove the fingerprint sensor. If that happens, this will be the biggest game-changer in tablet space. As we know that the tablet market is slowing down, these upgrades can give Apple a significant boost. There is a possibility of Apple launching the 2018 iPad Pros without a headphone jack. Many companies have been following this trend and now when Apple has its own AirPods, ditching headphone jack again for one of its products won’t surprise us. If Apple makes these changes, there are chances that the company will announce the AirPods 2 with the new iPad. Apple still has a lot of time to introduce these new products and maybe the company is planning to host a separate event for 2018 MacBooks, iPads, AirPods 2, AirPower Mat and everything they didn’t announce at the September event. A Japanese report suggests that Apple started production of the 2018 iPad Pro in July, but due to slow progress, the company couldn’t unveil the product in September. The report says Apple will most likely bring the new iPad sometime in November this year. If that happens, we should expect some teaser images and new leaks soon. Another interesting piece of information suggests that with the Face ID, the Apple iPad 2018 will gain TrueDepth Camera similar to the iPhone X’s. For the new iPad Pros, the company is not choosing the iPhone X design, which means there will be no display notch, instead, Apple is planning to reduce the overall size of bezels. Apple has also moved the smart connector from the side to the iPad’s lower back. Some of the leaked CAD drawings show this new design approach, but in reality, it remains to be seen how the iPad will work with these new changes. This year, Apple introduced a 9.7-inch iPad which is available at a starting price of $329. The iPad supports Apple Pencil and runs on the company’s A10 Fusion chip. In the iPad Pro category, we have two options – a 10.5-inch iPad Pro and the other one with a 12.9-inch display. They run on an improved A10X Fusion chip and feature a physical home button. The 10.5-inch iPad Pro is available for $649 and the bigger one with a 12.9-inch display can be purchased for $799. If Apple releases new 2018 iPad anytime soon, the price for the new tablets would be the same as the company usually slashes the prices of the existing models and introduces the new ones for the same price. Apple, not every year but sometimes, hosts a small event in October and if that happens, we can expect some or all of the unannounced products at Apple’s October 2018 event. This year also marks the twentieth anniversary year of the iMac, so fans are hopeful about one more Apple event this year. I do wonder if Apple even cares. Like it or not Apple fanboys will continue to purchase their Ipads.